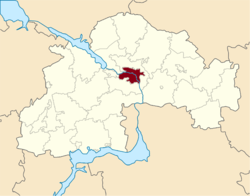 Dnipro (Ukrainian: Дніпро) is a city in Ukraine and is the third largest city in Ukraine. About 1 million people live there. It lies southeast of Ukraine's capital city, Kiev. It was founded in 1776. Dnipro enjoys a borderline semi-arid/Mediterranean climate (Köppen climate classification BSh/Csa), with relativity mild temperatures and plentiful sunshine year-round. Dnipro is one of the key places for the nuclear, arms and space industries of the former Soviet Union. ↑ "Global city GDP 2011" (PDF). This page was last changed on 12 August 2018, at 05:19.